The opposition has never won a presidential election in Nigeria, Africa's most populous state. BBC Hausa service editor Mansur Liman says that Delta is the only pro-Jonathan state still to declare, but his victory there is likely to be cancelled out once results come in from Gen Buhari's strongholds of Borno and Sokoto. The announcement of results was briefly disrupted when an agent of Mr Jonathan's People's Democratic Party (PDP) launched a tirade against electoral commission (Inec) chairman, Attahiru Jega in Abuja. 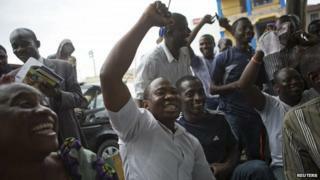 Gen Buhari's campaign spokesman Garba Shehu told the BBC: "We feel we have won because we have the numbers. We're in celebratory mood but we're not taking anything for granted because of the kind of government we have." There are long faces in the PDP camp. It looks like Muhammadu Buhari's lead may well prove too wide to be bridged. But this is Nigeria and predictions are dangerous. The biggest surprise would be if the result is not disputed by the losing side. During the vote, the card readers experienced some technical glitches, but they could prove to be decisive in ensuring the numbers could not be cooked and the views of Nigerians could not be ignored. International observers have broadly praised the conduct of the vote but there has been some concern over possible efforts to rig the outcome. The US and UK have expressed their concerns over potential "political interference" during the count. A spokesman from Inec dismissed these fears, saying that "there is absolutely no basis" to talk of meddling. Authorities in Rivers State announced a curfew on Monday night after protests over alleged vote rigging. Mr Jonathan gained a landslide there but Mr Jega said that while the fact-finding team had found some voting irregularities with the poll there, they were not enough "to warrant a cancellation of the election". Earlier, police in the state used teargas against female opposition protesters who were attempting to lodge complaints with election officials. Voting spilled into a second day in some parts of Nigeria after problems were encountered with new electronic card readers, which were introduced to prevent fraud. President Jonathan, whose PDP has dominated Nigerian politics since 1999, was among those whose registration to vote was delayed by the technology. Mr Jega said only a fraction of the 150,000 card readers being used nationwide had failed. The National Human Rights Commission said 50 people were killed during the balloting, many of them in attacks by militant Islamist group Boko Haram. As well as a president, voters are electing members of the house of representatives and the senate.